1 The Institute for Regional Conservation, Delray Beach, Florida, USA. 2 Plant Gateway, Bradford, UK. Agave sisalana is a cultigen from Mexico. In 1833 it was brought to Florida by Henry Perrine as an experimental crop. From there it was introduced to tropical Africa and Asia in the late 19th Century, where it became established as a fiber crop. Paradoxically, in the Yucatan it meanwhile evanesced from its already scanty presence. Because material was collected from cultivated stock in Chiapas in the 1950s and a neotype from there was selected in 1988, it was assumed to have originated in Chiapas. Did A. sisalana originate in the Yucatan Peninsula following Perrine (1838a, 1938b) rather than from Chiapas sensu Gentry (1988)? Agave sisalana (sisal), one of the strongest natural fibers in the world and a commercially important crop. Live plants were located in the Yucatan between 2013–2017. We document historical and current presences of A. sisalana in the Yucatan Peninsula following three lines of evidence: 1) overlooked records and reports in literature; 2) herbarium specimens; and 3) presence of extant populations. Eleven localities in the Yucatan Peninsula still have extant populations of sisal. We uncovered herbarium specimens from the region, including an original specimen by Perrine, from Campeche, which is selected as the lectotype for the name, superseding the neotype from Chiapas. We demonstrate the continued presence of Agave sisalana in the Yucatan Peninsula, even though it has now become rare. It is most likely that the crop was first domesticated there. Agave sisalana es un cultígeno de México. En 1833 lo llevó a Florida por Henry Perrine como un cultivo experimental. De ahí fue introducido a África tropical y Asia a finales del siglo XIX, donde se estableció como un cultivo de fibras. Mientras tanto, paradójicamente, en Yucatán evaneció de su ya escasa presencia. Debido a que se recolectó material cultivado en Chiapas en los 1950s y se designó un neotipo de ahí, se asumió que tuvo origen chiapaneco. ¿Se originó A. sisalana en la Península de Yucatán de acuerdo a Perrine (1838a, 1938b) en vez de Chiapas sensu Gentry (1988)? Agave sisalana (sisal), una de las fibras naturales más fuertes del mundo y cultivo comercial importante. Sitio de estudio y fechas. Se localizaron plantas vivas en Yucatán entre 2013–2017. Se documentaron presencias históricas y actuales de Agave sisalana en la Península de Yucatán siguiendo tres líneas de evidencia: 1) registros y reportes ignorados en la literatura; 2) especímenes de herbario; y 3) presencia de poblaciones existentes. Once localidades en la Península de Yucatán tienen aún poblaciones existentes de sisal. Se descubrieron especímenes de herbario de la región, incluyendo un espécimen original de Perrine, de Campeche, el cual se seleccionó como lectotipo para el nombre, remplazando al neotipo de Chiapas. Se demostró la presencia continua de Agave sisalana en la Península de Yucatán, aun cuando hoy día se ha vuelto rara. Es muy probable que el cultivo se domesticó por primera vez ahí. The Yucatan Peninsula in southeastern Mexico is known to be a region where crops of economic importance originated. Several native Agave species were long grown for their strong fibers. Particularly commonly used were fibers of henequen (Agave fourcroydes Lem., sak ki in Yucatec Maya) and sisal (A. sisalana Perrine, ya’ax ki in Yucatec Maya). Henequen and sisal are considered to be cultigens, plants of complex hybrid nature that were selected and domesticated by the ancient Maya (Perrine 1838a, Schott 1870, Souza-Novelo 1941, Colunga-GarcíaMarín 1998). As often the case with cultigens, the exact place of origin of A. sisalana has been disputed (Gentry 1982, Colunga-GarcíaMarín & May-Pat 1993). During the 1830s fiber from henequen became a major commodity, produced on a large scale in plantations in the Yucatan (Mease & Perrine 1834: 334, Cámara-Zavala 1977). The Yucatan was the only area of production until the early 1900s and it remained the principal region of production until the 1920s (Villanueva-Mukul 2012, Rioux 2014). This production focused on a particular form of A. fourcroydes, the sak ki, which grows well in the xeric to dry areas of the northwestern Yucatan Peninsula. In comparison, the production of A. sisalana was minor (Perrine, 1838a) with production located in drier to mesic parts in the eastern and southern Yucatan (Mease & Perrine 1834, Schott 1870, Dodge 1892, Souza-Novelo, 1941, Ortiz 1947, Mesa and Villanueva 1948). While stationed in Campeche from 1827 to 1837, United States, Consul Henry Perrine became interested in plants of potential agricultural use and sent plants and seeds from Campeche to the United States, where he expected they would thrive in the subtropical regions of Florida. In 1833, Perrine sent both A. fourcroydes and A. sisalana, which at that time were still uncatalogued taxa, from the Yucatan to southern Florida, where he and colleagues started experimenting with their cultivation (Perrine 1838a, pages: 47, 56, 59 to 60 and 87, 1838b, pages: 105 and 115 to 116). Although A. fourcroydes was the taxon more commonly grown in the Yucatan, Perrine was more interested in A. sisalana, which produced a more valuable, stronger and finer fiber. Perrine formally named A. sisalana in 1838 in an application for a land grant in southern Florida from the United States government (Perrine 1838a, 1838b). In 1838, Perrine established the Tropical Plant Company there and set up operations in propagating and promoting tropical crops on Indian Key in the Florida Keys. Perrine never saw the completion of his agricultural experimental station as he was killed on Indian Key in 1840 during the Second Seminole War. However, one of the experimental plants to survive this ordeal was A. sisalana, which adapted well to the climate of Florida and quickly naturalized along most of the coast of the Florida Keys and the mainland peninsula (Dodge 1892, 1893, Parsons 1895, Robinson 1937, Wunderlin et al. 2016). Between the late 1880s and 1900s, bulbils of A. sisalana were exported from Florida and Mexico to Africa and Asia (Drummond & Prain 1906, Robinson 1937, Lock 1962, Kimaro et al. 1994) and these plants initiated the commercial cultivation of A. sisalana throughout tropical and subtropical areas of the Old World on an industrial scale to satisfy the international market. Ironically, while the cultivation of A. sisalana spread rapidly to other continents (Lock 1962), it became rare in the Yucatan (Souza-Novelo 1935) to the point that by the 1950s some researchers failed to locate any plants, either in cultivation or in nature (Gentry 1982, Colunga-GarcíaMarín & May-Pat 1993). Therefore, Gentry (1982) proposed that A. sisalana probably originated in the Central Valley of Chiapas rather than the Yucatan, the only area in Mexico where he had observed plants in cultivation. The assertion that A. sisalana did not originate in the Yucatan Peninsula has been adopted ever since (e.g., Colunga-GarcíaMarín & May-Pat 1993, Colunga-GarcíaMarín 2003, Debnath et al., 2010). The aim of this article is to vindicate the Yucatan Peninsula as the area of origin of this cultigen, supported by three lines of evidence: 1) overlooked records and reports in specialized literature; 2) herbarium specimen collections; and 3) presence of extant populations. We additionally discuss the introduction of Yucatecan agaves into Chiapas and reintroductions to Mexico from Africa. Because we uncovered herbarium material collected by the author of the name (Perrine) from Campeche, we propose this specimen as the lectotype for the name Agave sisalana. This lectotypification supersedes the neotype specimen from Chiapas, which we thus propose to be abandoned. Confusion of identity in regional botanical literature. Taxonomic confusion is strife in the genus Agave due to widespread hybridization, poor specimen preservation and generally local and rare occurrence of taxa. The rarity of A. sisalana in the Yucatan Peninsula, combined with introductions of cultivated taxa and the name having been misapplied to other taxa, has resulted in confusion and doubt on the area of origin of this cultigen. In his book on the genus Agave in North America, Gentry (1982) cited conversations with botanists specializing in the Yucatan flora (e.g., Faustino Miranda, Bernice Schubert), who reported they had never encountered the species there. Gentry stated that no botanical collections of A. sisalana were ever made in the Yucatan and that it “has long been erroneously reported as of Yucatan origin.” Gentry (1982) then chose a specimen from Ocosocoautla [sic] in Chiapas (Gentry 16434, US; isoneotype DES) as neotype for the ‘species’, where it was cultivated in 1957 (see http://collections.nmnh.si.edu/search/botany/). In 1979–80 the Centro de Investigación Científica de Yucatán (CICY) was established, initially to study agaves in the region. In the following decades, the presence of A. sisalana in the Yucatan was validated, confused or rejected by various researchers. Between 1985 and 1987 several other researchers inventoried Agave taxa in the region, established experimental plots in Merida and produced a series of publications on the ethnology, taxonomy and systematics of the agaves of the Yucatan (Colunga-GarcíaMarín et al. 1993a, 1993b, 1996, 1999, 2007, Colunga-GarcíaMarín & May-Pat 1993, 1997, Colunga-GarcíaMarín 1998, 2003). These authors reported that A. sisalana was not found in the region either cultivated or wild (Colunga-GarcíaMarín & May-Pat 1993). However, A. sisalana was listed for the Mexican collection of Agave germplasm at CICY botanical garden, citing the Yucatan Peninsula as the source (Colunga-GarcíaMarín 2004). Castorena-Sánchez et al. (1991) reported and recorded A. sisalana based on Castorena’s specimens from 1982 and 1987 (cited in Results). They karyotyped A. sisalana together with other taxa including the African Agave ‘Hybrid 11648’. Similarly, Robert et al. (2008) presented the karyotypes of regional agaves including A. sisalana and cited the CICY botanical garden as source of the material, but no vouchers for the studied specimens were located in the CICY herbarium. Concurrent with the research just described, three floristic checklists were produced for the Yucatan Peninsula all included A. sisalana (Sosa et al. 1985, Durán et al. 2000, Arellano-Rodríguez et al. 2003). The first two checklists cite a mixture of collections under A. sisalana. These belong to: 1) the wild and common Agave angustifolia var. angustifolia (e.g., Calzada 6882, Espejel 349, Flores 9082, Puch 1135, Ucan 4291; CICY); 2) Agave sisalana from southern Quintana Roo (Orellana 96, Villers 11; CICY); and 3) Agave sisalana from experimental plantations in the Yucatan (Castorena 37, 38, 39, 39A, 39B, Franco 30, Orellana 75; CICY; see Results). The third checklist (Arellano-Rodríguez et al. 2003) has no herbarium vouchers cited and intermix the common names and environments for A. angustifolia, A. fourcroydes and A. sisalana. Because the name A. sisalana has been widely misapplied to various taxa in the past, it is to be expected that various specimens appear under that name, particularly frequently mistaken are wild A. angustifolia var. angustifolia and cultivated A. fourcroydes in Mexican publications (e.g., Borges-Gómez et al. 2008, Flores et al. 2010, Méndez-González et al. 2014), databases (e.g., CONABIO 2016a, 2016b) and miscellaneous literature (e.g., Chi Quej 2009). Campos-Ríos & Chiang-Cabrera (2006) also cited A. sisalana in their review of the type specimens of plants from the Yucatan Peninsula, but, because of the dubious understanding of the species for the regional flora, A. sisalana was omitted from the authoritative floristic checklist of the Yucatan Peninsula by Carnevali Fernández-Concha et al. (2010). Lines of evidence. Live plants were first discovered in 2013 (Trejo-Torres & Gann 2014–2018) in the southern State of Yucatan, which initiated further field research for more populations in the region. This was done guided by formal literature reports and by consulting local people who know the cultivation and populations of agaves in the region. We prepared herbarium specimens (deposited at CICY herbarium) and made photographs of the newly-found plants. Herbarium specimens.- We searched for herbarium specimens in regional and foreign herbaria (BM, CICY, F, K, MO, NY, UADY, US), including those with digitized images available on the internet. Literature.- We searched for reports or mentions in botanical, agronomical, anthropological, sociological, commercial or related sources (printed publications, databases, webpages), considering both common and scientific names (e.g., Agave sisalana, henequén verde, sisal, ya’ax ki, etc. taking variations of spelling into account). Species identification. The newly found populations were compared morphologically against existing herbarium specimens, species descriptions, plant photographs, crop accounts and ethnobotanical information in specialized literature (Perrine 1838a, 1838b, Schott 1870, Engelmann 1875, Trelease 1913, 1920, Gentry 1982, Franck 2012). Morphological features to distinguish A. sisalana from other similar agaves in the Yucatan (e.g., A. angustifolia ssp. angustifolia, A. fourcroydes, A. ‘Hybrid 11648’) relate to characters of the habit, trunk, leaves and prickles (Table 1). Agave sisalana does not makes a trunk, and has dark green and glaucescent (faintly glaucous becoming glabrous) leaves that in mature individuals are slightly arched upwardly. The prickles along the leaf margins vary, from being almost absent or inconspicuous but evident to the touch, to small but visible with the naked eye. When definite, prickles are regularly spaced and typically reddish/yellowish. Table 1 Comparison of some morphological features between Agave sisalana and other similar agaves native and introduced in the Yucatan region. Spontaneous clonal variants.- The presence or absence of prickles is variable in A. sisalana (Table 1; Franck 2012). Clonal variation in prickles was the basis for the now obsolete description of A. sisalana var. armata Trel. (Trelease 1913). This name was applied to plants with many (rather than few) weak prickles. It was introduced into the West Indies from Florida and the Yucatan (Trelease 1913). Trelease (1920) noted that A. sisalana f. (sic) armata could be as prickly as the wild A. decipiens Baker (1892) from Florida, which is a species similar to A. angustifolia var. angustifolia from Mesoamerica. A historical specimen collected by Gaumer belongs to the regularly-spiny form (F; link cited in Results). We have documented the clonal appearance of spiny morphs from inconspicuously-spiny ones, and vice versa, in plants of A. sisalana in the localities recently found, so the degree of prickles is an obsolete character to use in the identification. Nomenclatural confusion.- A source for the modern day confusion is the application of the Yucatec Mayan name ya’ax ki (= green agave; traditionally applied to A. sisalana) to a variant of A. fourcroydes (e.g., Colunga-GarcíaMarín & May-Pat 1993, Colunga-GarcíaMarín et al. 1993b, Colunga-GarcíaMarín 2003, Pérez-Miranda 2010, Guerrero-Medina & Díaz-Plaza 2013). Souza-Novelo (1941) instead used the distinctive name falso ya’ax-ki (= false green agave) for that form of A. fourcroydes, thus clearly distinguishing it from the true ya’ax ki, A. sisalana. There are orthographic errors for the epithet sisalana in the literature: ‘siciliana’, ‘sisalina’ and ‘sisaliana’. Dondé & Dondé (1874: 186) reported ‘A. siciliana’, but no reference material is cited. Subsequently Standley (1930) listed ‘A. siciliana’ of Dondé and Dondé as a synonym of A. sisalana and added two synonyms that appear in earlier literature: A. rigida var. sisalana Baker [a later homonym of A. rigida var. sisalana (Perrine) Engelm.] and A. sisalana var. armata (Trelease 1913) [cited as A. sisalana f. [sic] armata Trel. by Trelease (1920)]. In addition, ‘A. sisaliana’ was made into invalid combinations (Furcraea sisaliana (Perrine) Posada-Ar. ; Posada-Arango 1909), which persist in modern sources (Furcraea sisaliana Posada-Ar., Agave rigida Mill. var. sisaliana (Perrine) Engelm. (Campos-Ríos & Chiang-Cabrera 2006, IPNI 2015). The misspelling ‘Agave sisalina’ is also found in formal and informal iterature. Research approach and assumptions. We used a historical-geographical approach to bring together taxonomical, nomenclatural, distributional, ethnobotanical and agronomical information to confirm the putative origin and continuous occurrence of A. sisalana in the Yucatan Peninsula. In doing so, we adhere to these assumptions: 1) a taxon is native or autochthonous to its initially-known or assumed range unless proven different, weather it is a wild taxon or a cultigen and 2) Agave sisalana is dependent on a traditional agricultural landscape in the moist areas of eastern and southern Yucatan Peninsula (Mexican part) that has now nearly disappeared due to changes in land management. Evidence of A. sisalana in the Yucatan Peninsula. Original references of the species appeared in letters from 1832, 1833, 1834 and 1838, when Perrine used the name ‘Agave Sisalana’ for a yet not officially described plant (Perrine 1838a: 5, 8, 9, 47, 1938b: 39, 140, 141). Mease & Perrine (1834), wrote: “The different qualities of henequin [fibers] are obtained in this peninsula, from different species of Agave, of which two are chiefly preferred for cultivation. The sacqui [= A. fourcroydes] is the favorite in the vicinity of Merida, but the new plantations forming near Campeche, are filled with yash-qui” [= A. sisalana]. Perrine (1838a) narrated: “A residence of several  years in a tropical climate has enabled me to obtain a personal acquaintance with some of its valuable fibrous plants… gratified with the title of agaves…” … “… the planters give the preference to the Sacqui [= A. fourcroydes] and Yaxqui [= A. sisalana] of the natives, or the whitish and greenish ‘Henequen’.” … “Two varieties of that species, which I take the liberty to christen Agave Sisalana, …” (Perrine 1838a: 7–8); “…another native plant of Yucatan, which may take its name from the actual exporting port of Sisal…” (Perrine 1838a: 79). Species cataloguing.- When Perrine catalogued A. sisalana (Perrine 1838a: 8, 87–88, 1838b: 36–38, plates 1, 2, 4), he chose yashqui (sic) as the basis for the species description (Perrine 1838a: 87), and this conforms to our current understanding of the taxon (e.g., Gentry 1982, Franck 2012). The characters distinguishing yashqui (A. sisalana) from sacqui (A. fourcroydes) according to Perrine were the smoothness of the edges of the leaves and the proportions of flower parts. Lemaire (1864) described A. fourcroydes, which is easily separated from A. sisalana by its caulescent habit, regularly spaced strong prickles along the margins of the leaves and a larger and black terminal spine. Commercially the two are distinguished by their fiber quality and quantity, with A. sisalana producing a ‘higher quality’ fiber, but A. fourcroydes producing a larger quantity of a somewhat ‘lower quality’ (e.g., Perrine 1838a, 1838b, De Echánove 1846, Schott 1870, Dodge 1892, 1893, Ortiz 1947). Herbarium collections.- We have located 12 herbarium specimens of A. sisalana collected in the Yucatan Peninsula, two of them from the 19th Century and ten from the 20th Century (Table 2). Table 2 Herbarium collections of Agave sisalana from the Yucatan Peninsula, chronologically arranged. In some cases herbarium labels contain more precise locality data. Ca. 1827-1838 (without date), from Campeche (labeled as “Campechy”) (Perrine, s.n., NY); available online at http://sweetgum.nybg.org/science/vh/ Designated as lectotype here (see Discusion). In 1895, from Izamal, Yucatan (Gaumer 950, MO); available online at http://www.tropicos.org/Name/50183169 Collected for the project Plantae Yucatanae from the Field Museum of Natural History (F) that resulted in the Flora of Yucatan (Stanley 1930), but no specimen is present in the Field Museum herbarium (F; C Niezgoda pers. comm. 2014); it was never cited in the Flora of Yucatan. In 1922, from Yucatan (without specific locality) (without collector and number; catalog i.d. : 275986; F); available online at http://emuweb.fieldmuseum.org/botany/detailed.php A fiber specimen prepared by the International Harvester Co. In 1981, from Bacalar, Quintana Roo (Villers 11, CICY); record available at EncicloVida (CONABIO, 2016a). As ruderal in recovering forest. The locality, ca. 25 km from Chetumal, seem to correspond to plantations reported as “near Chetumal” by Halffter (1957); see Discussion. In 1982, from Ucum, Quintana Roo. (Orellana 96, CICY); record available at EncicloVida (CONABIO, 2016a). As living fence in a traditional cultivation ground. The locality, ca. 35 km from Chetumal, seem to correspond to plantations reported as “near Chetumal” by Halffter (1957); see Discussion. In 1982, from Merida, Yucatan (two collections: Franco 30, Orellana 75, CICY); record available at EncicloVida (CONABIO, 2016a). In experimental plantations at El Enlace - CORDEMEX. In 1987, from Mocochá, Yucatan (five collections: Castorena 37, 38, 39, 39A, 39B; CICY); record available at EncicloVida (CONABIO, 2016a). In experimental plantations at CIAPY. Literature reports.- Albeit not validated by herbarium specimens, if the identity of the species referred to is correct, botanical and agronomical publications provide further evidence for the presence of A. sisalana in the Yucatan Peninsula (Table 3). Even though we cannot discuss all literature here in detail, we provide a sample of additional supporting evidence for the continuous presence of A. sisalana in the Yucatan Peninsula from agronomical and anthropological references (Table 4). Table 3 Reports of A. sisalana in the Yucatan Peninsula from botanical and agronomical literature. Schott (1870) Included yaxci [A. sisalana] as a cultivar limited to the southern and eastern Yucatan (from SW to NE: Bolonchén, Tijhosuco, Chemax, Valladolid). Schott recorded: “The fiber of this variety is used exclusively for the finest fabrics and articles of luxury”. Dondé & Dondé (1874) Reported ‘A. siciliana’ (see Nomenclature in Methodology) and A. americana (later re-identified as A. fourcroydes) as sak ki. Dondé and Dondé described yaxci (= A. sisalana) as having very small teeth (prickles) and being used only in the manufacture of hammocks, highly valued for the softness of their threads. From this and Schott (1870), above cited, we know that the fiber of A. sisalana was considered of higher quality and was used for selective purposes. ”. As Schott (1870), above cited, they did not cite the works of A. sisalana by Perrine (1838a, 1938b). Engelmann (1875) Included A. sisalana as a cultivar in the Yucatan native flora, citing Perrine’s original publications. Engelmann did not elucidate on the abundance of A. sisalana but stated: “the variety known as Sacqui [= A. fourcroydes] and extensively cultivated in Yucatan”. Trelease (1913, 1920) Trelease reported A. sisalana as originally from Yucatan. Trelease (1920) reported it as “The species most extensively planted, as a source of fiber, outside the Yucatan.”, e.g., Chiapas and the Bahamas. From this and Engelman (1875), above cited, we deduce that the species was less commonly cultivated than A. fourcroydes in the Yucatan. Standley (1930) Included A. sisalana as being cultivated on a small scale in the Yucatan, and A. fourcroydes as the Agave most extensively planted in the Yucatan and the source of commercial henequen. Listed A. siciliana of Dondé as a synonym of A. sisalana. Souza-Novelo (1935) Presented photographs of the different Agave taxa recognized in the Yucatan, including A. sisalana (as yax-cí). Souza-Novelo (1941) Reported that A. sisalana was originally from the eastern Yucatan, where it was cultivated on a small scale and that it was poorly documented. Souza-Novelo wrote that A. sisalana was the only Agave that could be cultivated in the more fertile and humid lands of the eastern and southern Yucatan Peninsula (towards the current states of Quintana Roo and Campeche), where A. fourcroydes will not thrive. From Souza-Novelo (1941) and Standley (1930), above cited, we notice that A. sisalana could be defined as rare and poorly known in the region from the 1930s. Halffter (1957) Reported that A. fourcroydes was widely grown, while A. sisalana was less commonly cultivated in the Yucatan Peninsula. Halffter reported small experimental plantations of A. sisalana in the states of Yucatan, Quintana Roo and Chiapas, none of them on a commercial scale (see Discussion). Table 4 Additional possible reports of A. sisalana in the Yucatan Peninsula, mainly from agronomical and anthropological literature, chronologically arranged. Probably from the 1600s. As referred by Irigoyen (1975), cited in Irigoyen (2010). From the 1600s–1700s by Ricardo Ossado, as referred by Martín y Espinosa in 1834. At the same time referred by Irigoyen (1976), cited in Irigoyen (2012). From 1783 by J. M. De Lanz. Recorded by De Echánove (1846). From 1834. As referred by Irigoyen (1976), cited in Irigoyen (2012). From 1845. As referred by Cline (1948), cited in Cline (2010). --- Regil and Peón (1853), cited in Schott (1870). --- Meza-Andraca (1955), cited in Meza-Andraca (2012). --- Benítez (1956: 47, 226, 227). From 1964 by Julio May. Recorded by Morales-Rosas (2006). From 1969 by Villa Rojas. As referred by Littlefield (1976), cited in Littlefield (2012). --- Irigoyen (1975), cited in Irigoyen (2010). Extant populations in the Yucatan.- Until December 2017 we have confirmed the presence of A. sisalana at 11 sites belonging to eight municipalities throughout the State of Yucatan (Table 5, Figure 1). In the places where A. sisalana is recorded, it is usually not distinguished by the people from other agaves; all are called henequén or maguey, which are equivalent to Agave. Only one out of eight land owners called the plant by its Yucatec Mayan name ya’ax ki (sensu Souza-Novelo 1935, 1941). Table 5 Extant populations of A. sisalana in the in the Yucatan Peninsula, ordered alphabetically by municipality. In some cases herbarium labels contain more precise locality data. Chemax.- Ejido of Lol-bé, road between Lol-bé and Chan Carrillo, 13 September 2016 (Trejo 3103, CICY); Figure 1. A single plant. In secondary forest, on the side of a dirt road over stony soil. Persistent after cultivation. The species was planted decades ago by Mr May’s father; informant: Mr Daniel May. Mérida.- Town of Dzityá, 20 January 2017 (Trejo 3004, CICY). Three large and several medium and small plants. Ornamental in a farmland in town; fibers for food-wrap tying; informant and owner: Mr Román Pech. Mérida.- City of Mérida, Col. Industrias No Contaminantes, 15 October 2017 (Trejo 3009, CICY). Two large and many medium and small plants. Ornamental in a parking. Mérida.- Comisaría of Sierra Papacal, at Parque Científico Tecnológico de Yucatán, September 2016 (Trejo 3010, 3011, CICY). Eight plants. In situ collections of CICY germplasm bank. The plants were brought in 2013 from CICY botanical garden in Mérida (M Pulido-Salas pers. comm. 2017), whose previous source was CORDEMEX plantations in the 1980s (F May-Pat pers. comm. 2016). Oxkutzcab.- Ejido of San Agustín, in forest SE of the Ejido, May 31, 2013 (Trejo 3106, 3107, CICY); Figure 1. A few plants about 1 m tall and several plantlets. In a recovering forest. Persistent after cultivation in abandoned farm ca. 25 years ago; fibers were used for making traditional Mayan shoes; informant: Mr Venustiano Cutz. Peto.- At Centro de Adiestramiento de la X Región Militar, 26 March 2017 (not collected; permit needed). Several dozens of plants of all sizes. Ornamental in camp yards. Peto.- Town of Kambul, 20 January 2017 (Trejo 3105, CICY); Figure 1. About 12 large, several medium and many small plants. Ornamental and living fence in house garden. Plantlets brought some eight years ago from a relative’s home in a nearby town; informant and owner: Mr Francisco Lira. Peto.- Town of Peto, at Colegio de Bachilleres, 26 March 2017 (not collected; permit needed). Several dozens of plants in all sizes. Ornamental in school yards. Peto.- Town of Peto, 26 March 2017 (not collected; permit needed). About 10 plants including plantlets. Ornamental in a store garden; brought by an employee from his home in town. Seyé.- Road between Seyé and Canicab, 16 April 2015 (Trejo 3108, CICY). Two large and several young plants and plantlets. Ornamental; common name: ya’ax ki (it’s recognized name in Yucatec Maya); informant and owner: Mr Pascual Chuc. Seyé.- Town of Seyé, 16 April 2015 (Trejo 3100, CICY); Figure 1. Three large plants and several plantlets. Ornamental in home garden. Owner: Mrs Candelaria Tek. Valladolid.- Town of Kanxoc, 9 January 2017 (Trejo 3101, CICY). Two large and several medium and small plants. Ornamental.in farmland in town. Plants brought from another near-by family farm, planted in the past by Mss May’s late husband; informant and owner: Mrs Ana May. 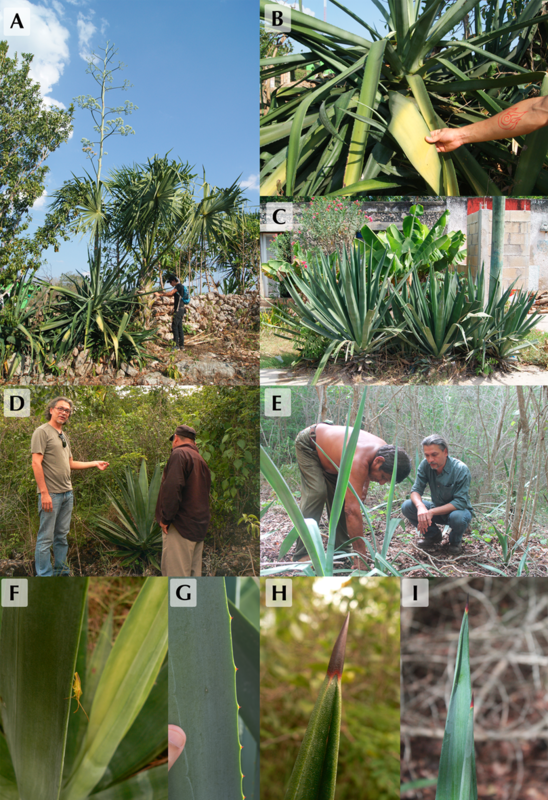 Figure 1 Photographs of Agave sisalana in several localities in the State of Yucatan (2013–2018). A and B. Flowering individual in a house in Kambul, Peto. C. Adult plants in a house in Seyé. D. Solitary plant (without plantlets) along a dirt-road in the forest in Lol-be, Chemax. E. Young plants in an abandoned farm in a forest in San Agustín, Oxkutzcab, with narrow and flaccid leaves due to growing in partial shade. F. Leaf margin with inconspicuous and irregular prickles (in Lol-be). H. Leaf margin with small and regular prickles (in Seyé). I. Terminal spine in a mature leaf (in Lol-be). G. Terminal spine in young plants showing typical colored bands (in San Agustín). In D and E the first author is conversing agaves and the site history with community leaders Daniel May (in Ejido Lol-be) and Venustiano Cutz (in Ejido San Agustín), respectively. See Table 5 for locality details, dates and vouchers. Images by JC Trejo-Torres (A, B, C, I), R Rivera (D, F) and GD Gann (E). Some of the towns in the eastern Yucatan where plants were found (Kanxoc, Valladolid and Chemax), were cited for former production of hammocks made of sisal (Espinosa 1860, Schott 1870, Mesa & Villanueva 1948: 2-3, Villa Rojas in 1969 cited in Littlefield 2012; see Table 4). Agave sisalana to be reinstated for the Yucatan Flora. Gentry (1982) stated that A. sisalana was native to Chiapas, rather than the Yucatan Peninsula and he thus designated a neotype from Chiapas. However, the original description by Perrine (1838a, 1938b) stated otherwise (Colunga-GarcíaMarín & May-Pat 1993) and thus this neotype was a poor choice. Gentry did not cite the protologue and plates (line drawings) from the U.S. Senate document, which were cited in earlier texts, he did not search for material that might be suitable for typification, and overlooked the publications of Trelease (1913, 1920) in which he mentioned that the ‘type’ of A. sisalana is from the Yucatan Peninsula, cultivated in Florida from plants imported by Perrine (see also Engelmann 1875). Superseding the existing neotypification.- As stated in our Introduction, the existence of a herbarium collection by Perrine recording Campeche as its locality, and the citation of Campeche as the native place for A. sisalana in the original publications allows us to designate this overlooked material as a lectotype, which supersedes the previous neotypification. Agave sisalana Perrine in Trop. Pl. 87 (8-9, 16, 47, 60, 86). 1838 -- Lectotype (designated here): Mexico, Campeche, without date, H. Perrine s.n. (NY barcode: 00-320079; available online at http://sweetgum.nybg.org/science/vh/). Agave sisalana introduced from the Yucatan to Chiapas. The concept of Chiapas as the area of origin for A. sisalana arose in the 1950s, after it had already become well-established as a crop plant throughout the world. It was then already commonly grown as an ornamental and had become locally naturalized (e.g. in Florida). Trelease (1920) reported A. sisalana as “The species most extensively planted, as a source of fiber, outside of Yucatán .... Called ‘Maguey tuxtleco’ [from Tuxtla Gutiérrez] in Chiapas”. Mesa and Villanueva (1948: 44) reported that henequen [Agave spp.] was introduced from the Yucatan to Cintalapa in Chiapas in the early 1900s but they did not mention Maguey tuxtleco, nor A. sisalana, when reporting three types of native agaves similar to henequen in the area of Ocozocuautla in Chiapas. They said that even though the production of Yucatecan henequens cultivated in Chiapas was soon abandoned due to the Mexican revolution (during the 1910s), the peasants from the Ocozocuautla area were still using these agaves to produce rope. When Gentry collected his neotype of A. sisalana in 1957 in Chiapas, there were contemporary plantations of the species in the Yucatan Peninsula. Halffter (1957) and Meza-Andraca in 1955 (cited in Meza-Andraca 2012) reported experimental plantations funded by the Banco de México near Tuxtla Gutiérrez, in the area of Catmís in southern Yucatan, and near Chetumal in southern Quintana Roo. Halffter cited that Chetumal plantation was the source of the bulbils used for these plantations. Gentry (1982) reported A. sisalana to occur from Cintalapa to Chiapa (incorporating the sites at Ocozocuautla and Tuxtla Gutierrez), but he also stated sisal as being grown as a fencerow and fiber plant, cultivated for native cottage industry. These localities in the northwestern Central Valley of Chiapas are the same localities that were reported by Trelease, Mesa and Villanueva, Meza Andraca and Halffter for Yucatecan agaves being cultivated there. Reintroduction of A. sisalana from Africa to the Yucatan? After sisal was introduced to East Africa, several forms and hybrids were selected there and taken into large scale production. Agave ‘Hybrid 11648’ was created in Tanzania where it is now commonly cultivated. Its fibers are equal in quality to those of A. sisalana and are commercially treated as sisal (Oyen 2011). Several of these African cultivars of sisal were introduced to the Yucatan (Table 1) complicating our quest to find native A. sisalana in the Yucatan, as they were often not distinguished in literature. Alternatively, reintroduction of A. sisalana from Africa either in the 1950s (Gentry 1982) or in later decades (R Orellana pers. comm. 2016), together with a rarefaction and disappearance of native populations in the Yucatan sometime between the 1930s and 1990s (Souza-Novelo 1935, 1941, Gentry 1982, Colunga-GarcíaMarín and May-Pat 1993) is a possibility. This technically would render the species as extinct in the Yucatan, but introduced to Africa and then reintroduced to the Yucatan. Of course, this would be based on circumstantial evidence and we therefore instead suggest that plants of A. sisalana collected and observed in the Yucatan have been there throughout the ages, albeit in fluctuating numbers. The possibility remains that both native and reintroduced plants are currently present in the Yucatan, in fact it is quite likely, but this would not contradict the documented occurrence and traditional cultivation of A. sisalana by Mayan peoples in the Yucatan Peninsula, before it was documented by Perrine. We are grateful to the following people holding plants or knowledge on agaves in the Yucatan: to Mr Venustiano Cutz from Ejido San Agustín (Oxkutzcab) for his guidance in the field and his information on the history of the site; to Mr Angelino Moo for proving information on African hybrids that he has cultivated in Hocabá for more than four decades; to Mrs María Barrera for confirming the date of the casual introduction of African hybrids to Hocabá; to Mr Eulogio Catzim from Hocabá, for providing us with information on past cultivation in some localities of the region; to Mr Romualdo Ku from Hocabá, for information on sisal leaf harvesting in Bacalar (Quintana Roo) in 1968; to teacher Antonio Pacheco for leading us to people in Ejido Lol-be in Chemax. We thank to the following persons for allowing us to see and collect their plants and providing us information on the plants: Mr Daniel May in Ejido Lol-be (Chemax); Mrs Candelaria Tek in Seyé; Mrs Ana May in Kanxoc (Valladolid); Mr Pascual Chuc in road Seyé-Canicab; and Mr Román Pech in Dzityá (Mérida); Mr Francisco Lira in Kambul (Peto). We thank to Engineer Américo Almonazid for helping us contact people in Ejido Hocabá; to Engineer Uriel Sabido who steered us to African sisal hybrids currently present in Merida; to Agronomist Rubén Guerrero who showed us plants in the town of Seyé and African hybrids in Merida; and to Dr Teresa Pulido for pointing out plants at the CICY germplasm bank. We thank to Roger Orellana for providing information on collections and plantations of agaves in the Yucatan Peninsula; to Filogonio May-Pat for providing information on past experimental plantations in the Yucatan; and to Alan Franck for the comments on the manuscript and help with identifying the species. We thank the following curators and herbaria for researching collections for sending digital images of exsiccata, or complementing data for specimens: Jacek Wajer (BM), Christine Niezgoda (F), James Solomon (MO), Rusty Russell (US), Silvia Hernández (CICY), and Barbara Thiers (NY). We appreciate Silvia Hernández and Germán Carnevali (CICY) for help in specimens processing of A. sisalana. * Corresponding author: Jorge C. Trejo-Torres, e-mail: karsensis@yahoo.com.mx. Author contributions: Jorge C. Trejo-Torres made the field discoveries, conceived the publication, developed the literature research and wrote versions of the manuscript. George D. Gann participated in field explorations, worked on the species identification, partially wrote the manuscript, revised versions of the manuscript and revised the English. Maarten J. M. Christenhusz worked on taxonomical and nomenclatural matters, revised and contributed to versions of the manuscript and revised the English.